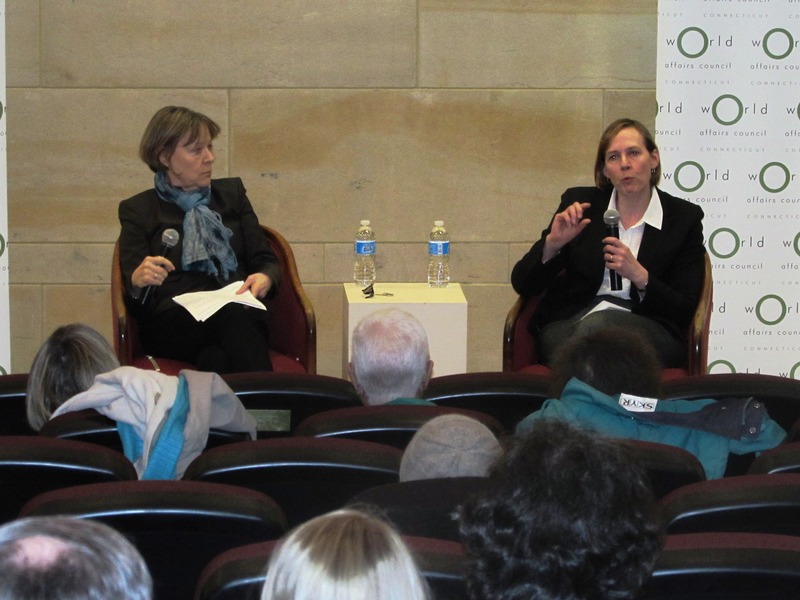 On Wednesday February 26, The World Affairs Council hosted a Global Conversation Series event “Understanding Muslim Societies.” “Understanding Muslim Societies” included a short lecture by Yale Professor Dr. Ellen Lust, and Q&A moderated by Dr. Heidi Hadsell, President of Hartford Seminary. Dr. Ellen Lust is an Associate Professor in the Political Science Department at Yale University. She has published many books and textbooks on Middle Eastern politics, and has done fieldwork studies in the area. For more on Dr. Lust, click here. Dr. Heidi Hadsell is the President of Hartford Seminary. Her work focuses on Social Ethics in a Global Context. She has earned degrees from varied universities around the world. For more on Dr. Hadsell, click here. Dr. Lust used her expertise to give a brief but thorough description of Islamic culture, tenants of the religion, and an explanation of how Islam interacts with governance. She spoke about how religion may play a larger role in personal and state identity in Muslim societies. The interactive program The second half of the program was a question and answer session, moderated by Dr. Heidi Hadsell. Audience members asked their questions, and Dr. Lust responded with clarity and detailed explanations of her opinions of the matters. We had a packed house! The audience was full of council members, interested community members, teachers, and many students. Many people even stayed after the program to discuss Muslim societies further with Dr. Lust. The audience walked away with a deeper understanding of Muslim societies and gained insight into facts about the Islamic world from distinguished academics! This program was part of a series coordinated by the World Affairs Council of America. Many other councils hosted Carnegie Endowment for International Peace experts on Muslim societies. To find out more about these programs, click here. Next Post St. Patrick’s Day in Ireland!